We all live in a global village these days as technology has surpassed many difficulties of life. With just a click in our PC, laptop, or mobile phone, we can order food, book a cab, and do our shopping also. So, no distance actually seems to be a long one. In this global maze, if your friend or relative lives in the wonderful land named Singapore, you can send flowers to Singapore and wish them on some special occasion like birthday, anniversary, Valentine’s Day, or New Year, etc. May be you have recently relocated to India and your family stays in Singapore and you are missing them dearly. Just login to our website and first of all have a look at the alluring flowers and other variety of gifts to make your loved one’s day a memorable one. Electrifying Respite is one of our best selling products that comprises mainly of pink and white roses along with other fillers. The Singapore florist have beautifully tied these flowers into a charming hand bouquet and it would be a perfect gift of love for your girlfriend. 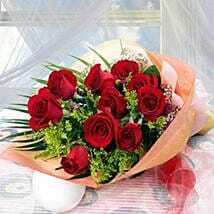 All other colors of roses are also available here which is the best expression of emotion of love. 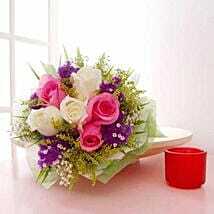 So, get the flowers delivery in Singapore with our excellent services. We are in the business of gifting for more than two decades and after being a favorite of Indian customers, we have also delved into the international arena with our plethora of flowers and gifts. 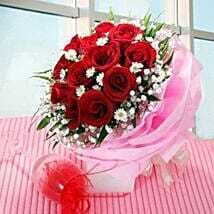 Order flowers online in Singapore to make sure that your loved one receives the best wishes in the most unique way. 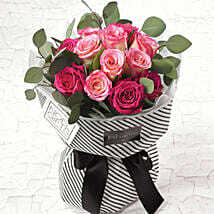 You would get a large variety of flowers and trustworthy delivery timeline and thus you can rely on us. 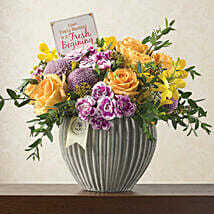 Roses, tulips, lilies, lavenders, cymbidiums, bird of paradise, anthuriums, carnations, orchids, etc. are found in artistic bouquets. In category of other gifts, cakes, chocolates, personalized stuff like coffee mug, teddy bear, cushion, and lampshade, sweets, dry fruits, etc. are waiting to be ordered by you. Using exclusive services like Midnight Delivery, Express Delivery, Same Day Delivery, Next Day Delivery, and Fixed Time Delivery, send online gifts to Singapore through Ferns N Petals. Any special moment requires a loving gift to be remembered forever. Here in Singapore flower shop, we have flowers and gifts for each and every type of festival or occasion you want to celebrate. Electrifying bouquet is one of our best selling products and when this is combined with the best-selling cake named Chocoholic, the combination is perfect for gifting. This is a much favorite combination for customers staying in Hong Kong, Germany, and Malaysia. Another important product that would take your breath away is the Sweet Wake Up which comprises of an adorable Teddy Bear, coffee mug, mixed nuts, wafers, and dark chocolates. 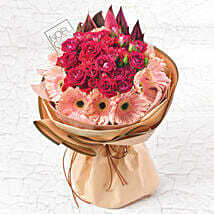 Choco bloom is another product which is a bouquet of Ferrero Rocher chocolates. Both these sweet products are often ordered in combination by people of Hong Kong, Malaysia, and Germany. Have a close look at them and get the online flower bouquet delivery in Singapore selecting your favorite combo among these and many other gifts. 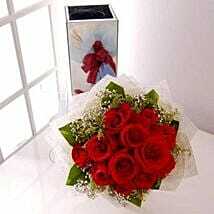 Ferns N Petals is the best online gift portal in India. The extensive collection of gifts along with a network of delivery all over the world make it a customer’s favorite. 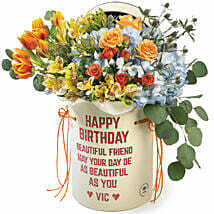 We have gifts for all kinds of occasions and festivals. Thus, for this upcoming Mother’s Day on 12th May 2019, you can check the perfect Mother’s Day gift ideas here on our portal. Among all kinds of gifts, flowers are the best ones as they symbolize love, beauty, refinement, grace, elegance, admiration, respect, appreciation, and gratitude. 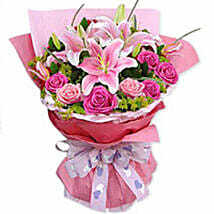 So, to make your mom feel special, send Mother’s Day flowers to Singapore using our next day delivery services. 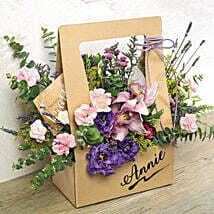 Explore the variety of flowers like roses, lilies, orchids, chrysanthemums, tulips, carnations, anthuriums, etc. available in a variety of colors like red, pink, yellow, orange, white, green, and blue. 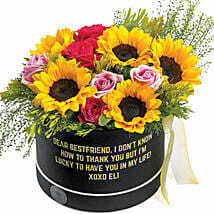 These flowers are available in bunches, bouquets, and vase/box/basket arrangements. So, select the best-looking flowers and get the Mother’s Day flower delivery in Singapore easily without any hassle at all. Apart from flowers, you can also send Mother’s Day hampers to Singapore where we have thrilling cupcakes, dry fruits, dark chocolates, fresh fruits, etc. to surprise your mom.